Even the best articles under-perform without attention grabbing headlines. Headlines briefly summarize the content to let the reader know what to expect. You may be tempted to come up with something clever on the fly, only to find traffic numbers depressingly low. Who knew ‘My Favorite Dog Toys’ wasn’t a catchy title? Why are titles so important, anyway? Consider the last time you stood in line at the grocery store. Magazines know the best titles are cover material, while the rest are for dedicated readers to sort through. Article titles are just like that cover page, being the determining factor in whether someone reads it or not. The success of your post depends on those 20 words or less to kick off the rest of your efforts. 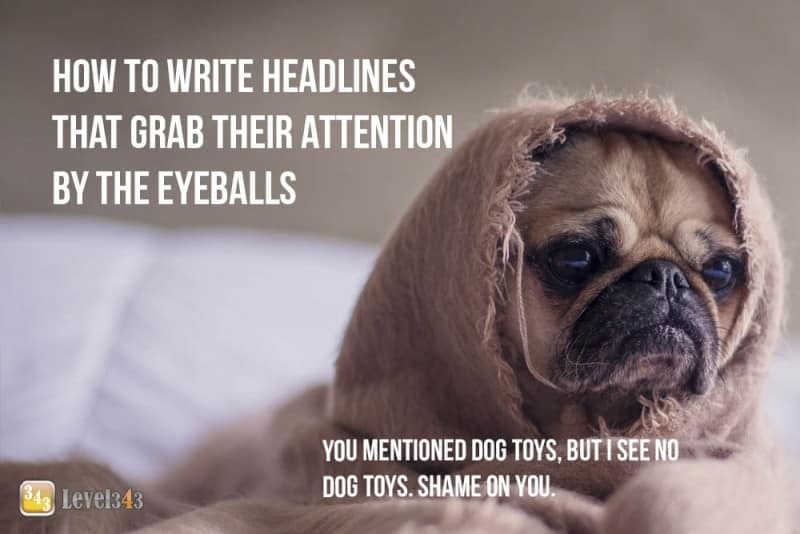 With less than a few seconds to grab the attention of your site visitor and pull them into your site, your headline is the most important element (this applies to email subject lines, headlines on ad copy, and titles on articles as well). When someone lands on your site, they are not actually in your store yet. If they’re on the home page, they are really standing outside your store, looking at the sign and the window display and trying to decide if they want to come in. Your headline is your sign and your window display – it has to compel them to take action – to come in and browse. Once they start reading your copy and checking out what you have to offer (clicking product links, looking at pictures etc), then they are actually in your store. Now your site has to sell them – your content acts as your sales person and describes the benefits of the items you are offering. There are different headline approaches – which headline is best really depends on your product or service and your audience. For example, are you writing headlines for an ad campaign, an article, a blog post or a sales page? People are scared of marketing. They don’t want to create hype, they don’t want to be “over the top” and they are sure because their product and/or their content is so good, it will “sell itself”. To be very blunt, that’s a mistake. However, you can have the best of both worlds. If you want to go with a strong headline but don’t want too much hype, then you can go with a benefit-oriented headline that promises something but isn’t too over-the-top. You can also create some curiosity. You’ve created curiosity, you’ve told them what they can expect to learn and you’ve kept the hype to a minimum. These headlines are effective but sometimes you need a little more than that. If your competitors are all promising the same info, yours isn’t really going to stand out. You need to step up your game. Yes, most people are afraid to get bolder in their marketing. No one wants to offend their readers or harm their credibility. But the truth is, this stuff works! There is definitely something to be said for knowing your audience and targeting your copy, but there is also a time to push the envelope and see if you can improve your response. Another way to craft an effective headline is to talk to people’s pain –tap into whatever emotion people have based on their need. Tip: Fear of loss is a greater motivator than desire to gain! That means people are more often motivated by missing out on something than they are by the thought of gaining that same thing. The end result is the same – they acquire an item – but it’s how you present it: Get This versus Don’t Miss Out On This. When you word it like they may be missing out on something it motivates them more. Here are some headlines that tap into the “pain” (the emotion behind the need). Stop Banging Your Head Against The Wall To Get Top Rankings – Don’t Miss Out On Insider Secrets To Make Your Quest For Rankings Easier. I’ve addressed their pain and I’ve also promised a benefit and played up the fear of loss angle. Notice the specificity of the number. Claims are always more believable when they are very specific. Always test different headlines and see what works for you. You may be familiar with AIDA. It stands for Attention, Interest, Desire and Action. To break it down further, it means you have to remember to: capture your reader’s attention, arouse their interest, increase their desire and lead them to take some kind of action. So, what does it mean to increase their desire? It means you elicit an emotional response from them. People buy based on emotion. So, the key to remember is that you want to illicit an emotional response from the reader. The first part can cause people to feel uncomfortable (fear) – they don’t want to be the only one that doesn’t know! Also note that it starts with the word Discover. I could have said Learn, but Discover is a stronger action word. Look at every word and see if there is a stronger one you can use. Sometimes one word makes all the difference. That’s not a question about the point of titles. The first consideration when creating an attention grabbing headline is how useful the content is, and who will benefit from the information. Simply summarizing the article leads to flat titles that imply boring content. Dig deep into the subject and determine why your readers will benefit from the information. If you can’t find anything, you may need to scrap the article and start over, or review what your target market wants. For example, toys can help manage overactive dogs. The benefit is less effort and stress for anyone that deals with energetic breeds. With so many articles out there, readers have a habit of passing up otherwise helpful information because it doesn’t seem important right now. Your article might sound useful, but unless there’s a bit of urgency to it they’ll just note the reference and move on. While a lucky few might have an urgency because of circumstance, most of your audience will need extra incentive to apply the benefits to themselves personally. Think about the benefits again, but reverse them into consequences. What can you promise to solve for the reader that hits home for your target audience? For our example, the toys are an alternative to hours of walking the owner may not have. You want to be ‘ultra-specific,’ meaning to take the mystery out of the equation. You may be thinking, “But clickbait works!” Yes, clickbait does get the click, but it doesn’t get the conversion. Intrigue only lasts long enough to answer the nagging question before the reader gets bored and looks elsewhere for less ‘scammy’ articles. For conversion, you want readers to be interested in reading the content, and that means being as targeted as possible. Remember to deliver on the promise your title makes, otherwise readers will leave disappointed. How Much Time Do You Spend Walking Your Dog? Creating a title that really grabs the reader is challenging, despite its simplicity. What seems simple isn’t necessarily easy. The effort you spend in designing interesting, attention grabbing headlines will show in your traffic numbers and bounce rate. If an article isn’t performing very well, rework the title and see what happens. You may be surprised how much of a difference it makes. Writing headlines is often a process, you get the basic gist down and then you go word by word and see how you can improve it. Let’s walk through a sample. – This is getting better. You’re implying there is a lot of information out there and telling them that you have the most important information. It is still too vague though. – This is more direct and makes people feel like there are some very important and specific pieces of information they need to have. This has now created an element of fear – fear that they are going to miss out on knowing the Top 3 most important things. Of all the things there are to know, these 3 are the things you must know, no matter what. – We’ve have added another element to be afraid of. Now people are not only afraid of what they don’t know but they’re also afraid of losing sales because of it. There’s also an additional verb at the start and we jazzed up the wording to create more of an impact. So that covers step 1 (using AIDA) Now on to step 2…. Use action words – verbs! An example would be: “Discover Top Weight Loss Secrets” instead of just saying “Top Weight Loss Secrets”. You’ll notice the specificity again – 6 minutes. If it had said 5 or 10 there would be less impact. A lot goes into creating headlines that grab visitors’ attention. Much of it is psychology – learning what makes people’s minds tick. In fact, a lot of time, effort and research have gone into writing the perfect headline over the years. Do you know how much testing magazines do to come up with the headlines you see on the covers each month? It’s shocking. Tip: take a look at headlines on Vogue and Elle and other magazines and try using their formula for your own headlines – they’ve spent a ton of money getting those headlines right, so use them as a guide! It might take some time to get it right. After all, one person’s catchy title is another person’s over-hyped headline. It’s possible to get it right more times than you miss. Follow the principles of AIDA (Attention, Interest, Desire, Action). Check your headlines against the 4 U’s (Usefulness, Urgency, Uncertainty, Uniqueness). Don’t forget to spice it up with action words and BAM! You’ll be writing titles that grab them by the eyeballs, pulling them into the content. Once they get to the content… well, that’s another blog post. To your success! In online marketing, you have to get eyes on site before you get sales in pocket. We can help with that. If your traffic is limping and your CTR is non-existent, contact Level343. We’ll get things flowing in the right direction. This account is where everyone involved with Level343's content marketing efforts shows up. You can say there is no "I" in this team. Sometimes we will chat about a certain topic with a variation of ideas, suggestions, even opinions. Then one of us will start writing the post, hand it over to someone else who will continue the diatribe. Eventually it ends up on our editor's desk who either chops the hell out of it, or you're reading it right now.